These two facing pages were created using a combination of techniques. As Borin believes that the best forms of collage in this context are created using 'hands-on' methods of cut and paste assemblage, the initial black and white panels were created separately; the first to appear on page one was made during Borin's 'sketching/signing session' at the Bristol Comics Expo in May, 2006, where he was a guest creator (very deiform). 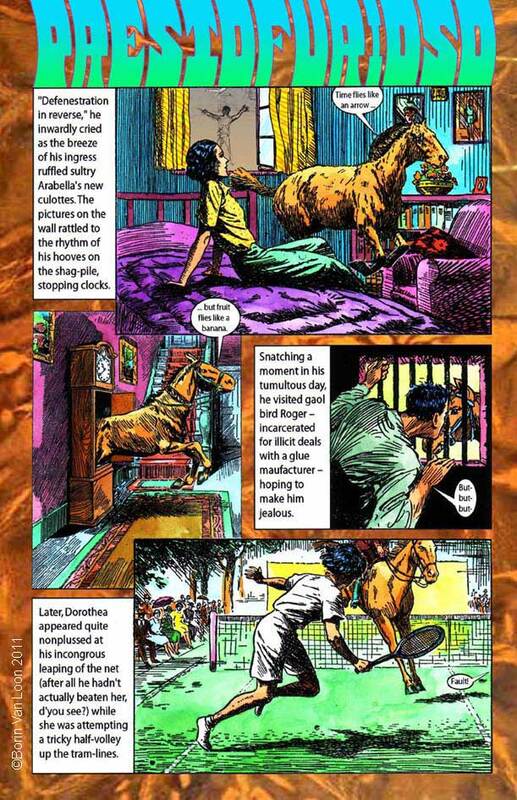 The various panels were then resized into an initial assemblage, scanned into Photoshop, imported into Illustrator and the rectangular text panels added. These two putative pages were printed out on heavy white paper, soaked and stretched on a drawing board with gumstrip and, when dry, the watercolour dyes and gouche added. The speech bubbles were pasted in and the whole thing rescanned and placed against the backgrounds in Illustrator. 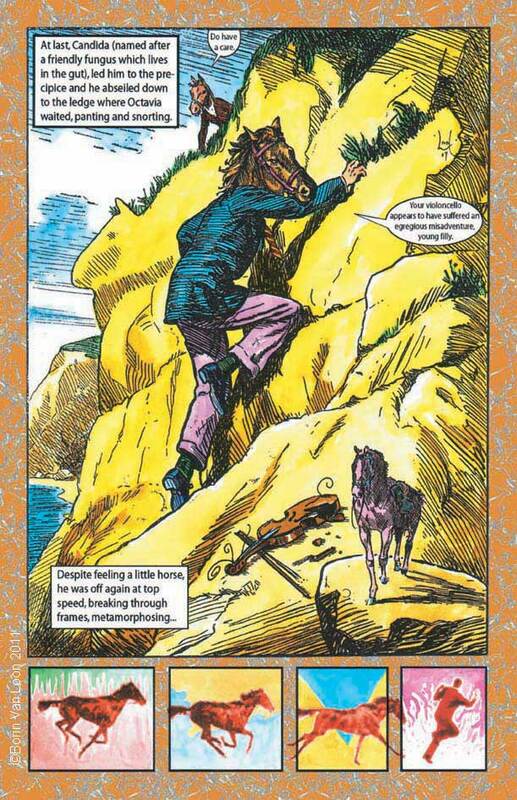 The b/g on page one was from an old marbled book end-paper, that on page two was created in Photoshop using an overlaid line drawing of a horse pasted in many times over a sympathetic background colour. The masthead lettering was hand-drawn, scanned in and coloured using Photoshop. The figure seen through the window of the first frame of page 1 is a quotation from the preceding spread by Steve Joyce; the figure at the foot of page two prefigures the running man on the following spread by Dave Upson. See the Links page for Freelance site and - eventually - information about the project now entitled 'He opened his eyes'.